Tim Barfoot, an engineering professor with the University of Toronto who is overseeing his school's team, said 250 students have expressed interest in joining the team. Canadian university students are clamouring to build a self-driving car for General Motors. They're hoping to join one of two “AutoDrive Challenge” teams at the University of Toronto and the University of Waterloo. The two Canadian schools will compete against each other and six American schools in the challenge issued by GM and SAE International by on April 4. The AutoDrive Challenge teams will be tasked with developing a self-driving car that can perform in an urban setting by 2020. Tim Barfoot, an engineering professor with the University of Toronto who is overseeing his school’s team, said 250 students have expressed interest in joining the team. Both Canadian schools say their teams will be large. Barfoot thinks his team will have 100 students, but he’s now scrambling to figure out how to accommodate everyone who is interested. Derek Rayside, an electrical and computer engineering professor at the University of Waterloo who is overseeing his school’s team, thinks his team will be upwards of 50 students, but admits that could number could grow. “There is huge, huge interest here, in just a few days,” Rayside said, noting his university has already selected a name for the car: WATonomous. The other schools competing are Kettering University, Michigan State University, Michigan Technological University, North Carolina A&T University, Texas A&M University and Virginia Tech. Each school will receive a Chevrolet Bolt, General Motors’ new electric car, to work on. Intel will provide the computers needed and third parties will provide sensors. The rest will be up to the students. Next spring the schools will enter the first phase of the competition that will test straight roadway driving and object avoidance. By the third and final phase, which will take place at General Motors’ test facility in Yuma, Ariz., the cars will be navigating a complex urban setting, according to General Motors Canada spokesperson Uzma Mustafa. The upshot for General Motors is simple: they’re looking to create a pipeline of well-trained engineers to hire in the company’s big push towards self-driving cars and related technologies. At an event with Prime Minister Justin Trudeau last June, the Detroit-based car company announced it was looking to hire about 700 engineers in the next few years, many of whom will work at a new automotive software development centre in Markham, Ont. “We have cars being tested in the United States and this is a good talent pool to see where the ideas are,” Mustafa said. Rayside said the competition is unique because it is geared for undergraduate students. Artificial intelligence research is a booming field at his school, he said, with at least 20 professors working on various aspects of it, including many in the automotive area. But much of that research is limited to professors, post-doctoral fellows and graduate students. The goal is to achieve what’s known as “level four” autonomy by the end of the competition, Rayside said. “That’s a very ambitious goal, but it’s good to have ambitious goals,” he said. Level zero is no automation, Rayside explained. “Level one is stuff like lane-keeping, so you start drifting out of the lane and the car can nudge you back into the lane and that’s on the market now,” he said. 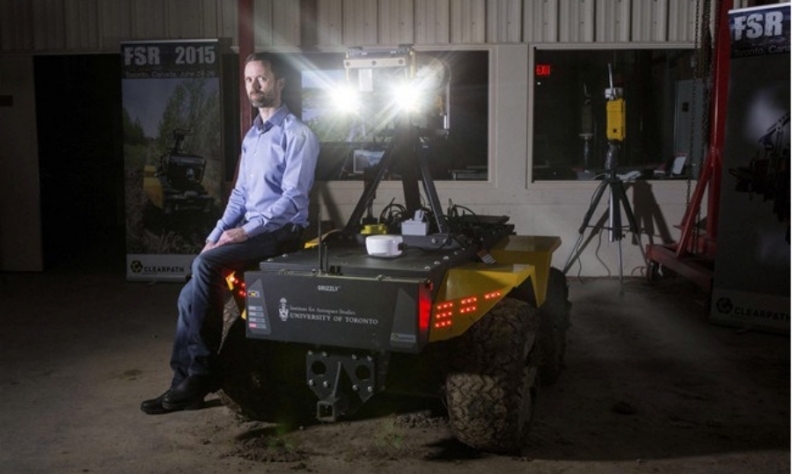 At level three, the car starts driving on its own, which isn’t available to the public, but exists at research facilities, he said, including at the University of Waterloo, where the self-driving “Autonomoose” — developed by a team of professors, researchers and graduate students — is being tested.